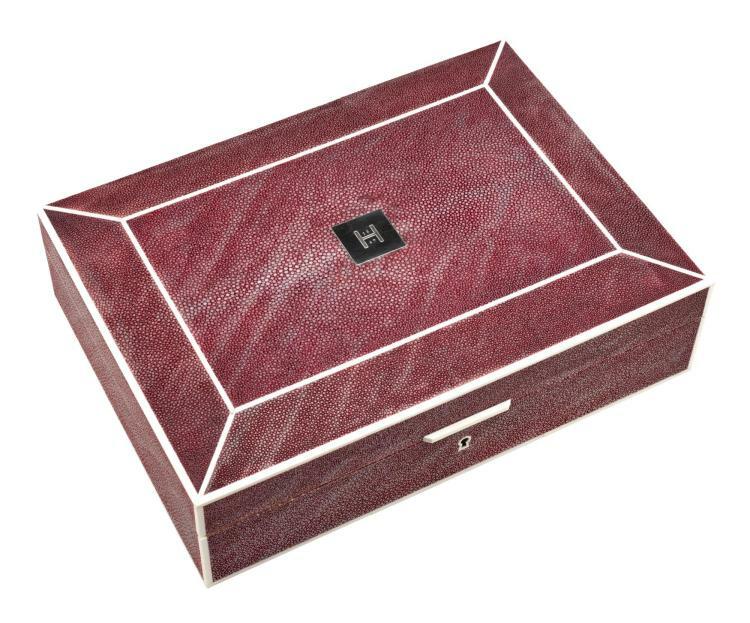 Description: Inspired by the ultimate Sharkskin-Worsted Scottish Wool & Silk that is an old favourite Huntsman suiting cloth, Huntsman asked Cuirs d'Ocean, the finest shagreen bespoke object maker, to produce a Huntsman Claret Watch box with removable cufflinks tray in shagreen. A rawhide consisting of the rough, untanned skin of shark or stingray, shagreen is harder than ivory, and was used on armoured breastplates during the reign of Louis XIV. This exclusive creation is lined in beechwood, with Huntsman's H1849 logo on a Sterling Silver plaque embedded into the Shagreen and bone inserts. The box holds up to six watches and eight pairs of cufflinks, however the beechwood trays can be removed for more flexible storage options.